iMacsoft iPhone to Mac Transfer, the excellent iPhone and iPod management tool is specially designed for Mac users. iMacsoft iPhone to Mac Transfer can fast transfer, rip, copy and manage your music, videos, photos, podcasts and TV Shows between iPhone/iPod and Mac and add them to your local iTunes library. All formats compatible with iPhone are supported. iMacsoft iPhone to Mac Transfer latest update supports iPhone 3GS (iPhone OS 3.0). G4/G5 processor or Intel processor, 512MB RAM or above. iMacsoft iPhone to Mac Transfer can manage your iPhone or iPod Touch like an external hard drive.Also you will find that quick search and filter tools help you hit what you want as easily as iTunes does. iMacsoft iPhone to Mac Transfer supports all types of iPhone/iPods including iPod classic, iPod nano, iPod touch, iPhone, iPhone 3G, iPhone 3GS and so on. Your iPhone, your way. 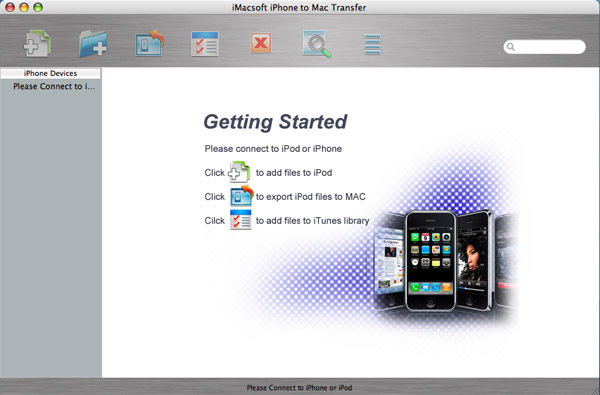 iMacsoft iPhone to Mac Transfer provides an ideal solution for you to manage, rip, copy, backup iPhone or iPod on Mac. Transfer, copy or backup iphone photos to Windows PC Computer. Transfer iPod video, iPod music, podcast and TV shows from your iPod to MAC. Transfer iPhone SMS to computer as a txt file or a ANTS file. Transfer YouTube/Google Videos to Your iPhone. Transfer iPod/iPhone music and video, iPod podcast and TV program to Mac. Copy music files from iPhone to pc desktop. Tansee iPhone Transfer for transfer song/video from iPhone to computer. Qweas is providing links to iMacsoft iPhone to Mac Transfer 2.9.8.0531 as a courtesy, and makes no representations regarding iMacsoft iPhone to Mac Transfer or any other applications or any information related thereto. Any questions, complaints or claims regarding this application iMacsoft iPhone to Mac Transfer 2.9.8.0531 must be directed to the appropriate software vendor. You may click the publisher link of iMacsoft iPhone to Mac Transfer on the top of this page to get more details about the vendor.